Free Shipping Included! Joagym Orb Fat Grip - Best Thick Bar Grips for Fat Bar Training for Muscle Growth and Strength by Joagym at Strongman Pictures. MPN: MU-JX5D-0YGI. Hurry! Limited time offer. Offer valid only while supplies last. [Why Thick Bar Adapter?] Thick bar is harder to handle than normal sized grip that it requires more concentration to be effective while exercising. Orb grip has different shape from normal thick bar grip or fat grip. This grip is mainly designed for various sports that requires stability and irregular grip force. While exercising, most of weight load is applied to the fingers, so Orb grip helps to develop the power of the finger and fine sense. Made of high quality durable silicone that is possible for permanent use. Easily attachable to various weight training tools like dumbbell, barbell, etc. Both ends are projected to prevent injuries caused by slipping it off. Orb grip can be applied to a wide range of sports and activities such as baseball, volleyball, tennis, climbing, arm wrestling, etc. BEST PERFORMANCE IN RECORD TIME - You do not have to spend many time to build up your arm, shoulder, or chest size. Orb Grip will lead you into best effective exercise in record time. 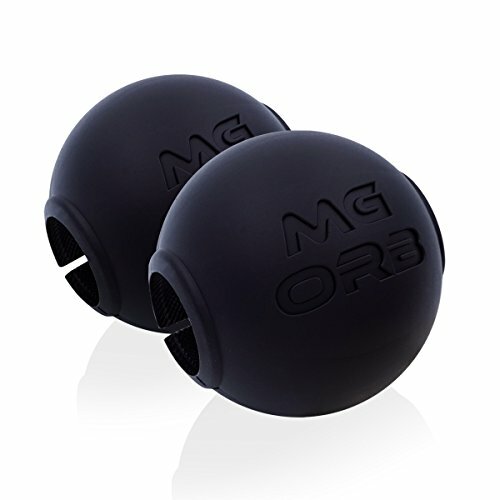 PROFESSIONALS RECOMMENDED - Orb Grip is being used many domestic and international athletes, arm wrestlers, weight trainers, strongman, and bodybuilder. It's time for you to join into thick bar training.